Friends, family, complete strangers — it is with all the humility that I can muster that I would like to announce that I have won the lottery! I have won 900,000 british pounds in a lottery in some foreign country that I’ve never heard of and never entered. Can you believe it? Now I know it’s dangerous to share my personal information with strangers, but it’s ok in this case. I know that because this is from ‘Rev‘ ‘Dr’ Giller Jackson. I can trust a man who’s a reverend and a doctor, right? And you want to hear the kicker? I just looked in my spam box, and I have won 5 other lotteries, plus I apparently owe the Nigerian Revenue Service a crap load of money in taxes. …I better get right on that. There’s a great story on the NPR program ‘Fresh Air‘ that I listened to last night on the way home. It’s about these kinds of scams and stuff. Check it out. 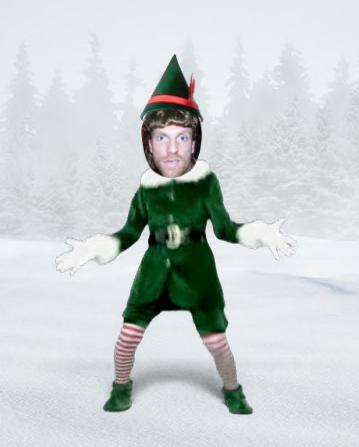 There’s a pretty funny add campaign called “Elf Yourself”. This happens to coincide with a week when I have a photo of myself wearing a mullet wig from a party we went to.